Lior Perlmutter and Avi Nissim met at elementary school. Lior began to play synths at the age of 11, and at 13 he formed the band Paradox along with Yaniv Haviv. Avi also began to mix at parties at an early age, as well as playing in Indus acts. In 1989, Lior and Avi launched their project SFX, whose first success was Monster Mania in 1991. When Yaniv left to achieve his military service, Avi and Lior went to New York. Shortly afterwards, Avi came home while Lior stayed to work as a studio technician. Avi relaunched SFX with Yaniv and Guy Sebbag. In 1994, Lior came back in Israel and founded along with the SFX members the labelTrust In Trance, whose first CD Trust In Trance 1 was successfully distributed by Phonokol. Guy left the group. In 1995, the second CD Trust In Trance 2 containing the first tracks of Yaniv, Avi and Lior as Astral Projection was released. 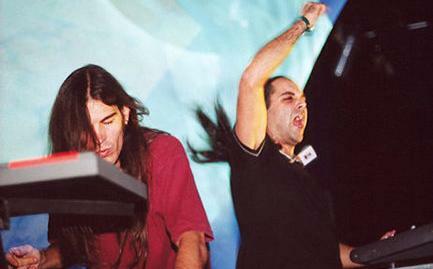 After the great success of Trust In Trance 3, in 1996, Astral Projection was awarded Kings of Israeli Trance. Successes came one after the other, always faithful to the same musical concept : The Astral Files, first album under the name Astral Projection, Dancing Galaxy in 1997, a compilation of classic SFX tracks in 1998, Another World in 1999, a kind of " Best of ", In the Mix, in 2000 and the last opus to date Amen in 2002.